Colliery, on front of new stone lamp-house. Plaque approx. 4 feet high in stone classical setting approx. 8 feet high with pedimented top and flat fluted columns on each side. In the pediment is a wreath raised in half relief. On the plaque, the names are incised in three columns. Bronze plaque in stone setting. 1. 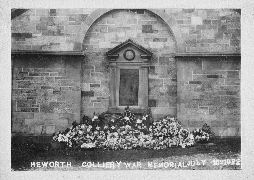 More men from the colliery had served in the 13th NF than in any other unit. 2. There were 2,033 men and boys at the colliery. There were 860 between the age of 18 and 40, and 788 joined the colours. The other 72 were all permanently unfit. 3. The two children in the photograph taken in 1962 are the son and daughter of Mrs. Philipson, now the Verger of St.Alban’s, Heworth. Old photo taken after unveiling in 1922, and one of two children standing in front of the memorial. Newcastle Weekly Chronicle 22/07/1922 reports unveiling. Illustrated Chronicle 17/07/1922 reports unveiling with photos. The names below have been extracted from a newspaper report.